Configuration: (1)Comfortable soft rubber grip handle, thickened cutting edge, ergonomic design; (2)Can be used either straight or at a 90 degree angle; (3)Compass is on the handle; (4)A serrated on one side of the blade. Easy To Take: Ultra lightweight and super compact tools, the handle of which can be folded twice. And a carrying pouch is presented for hanging on a belt or backpack.When folded it can easily be packed on a camping or beach trip or carried out to the garden. 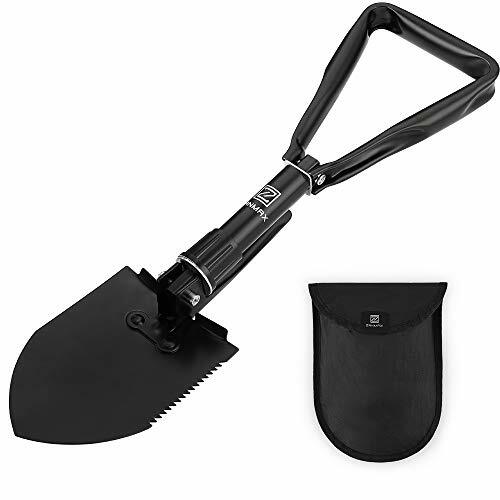 Survival Tool: Trenching shovels are another name for the folding shovel since its pointed type of blade makes it suitable for digging trenches around campsites to collect water away from the campsite. A folding camping shovel can also be used to scoop out rocks and flatten a surface for a tent as well as dig holes for tent stakes. Folding shovels can also be used to create a fire pit. Remove Ice&Soil: These tools also make mini snow shovels for digging tires out of snow banks or dirt if a car becomes stuck. It include a pick tool that can help crack ice or remove rocks. Endurable: Made of strong tempered forged steel can be used to saw off lightweight branches. If you have any questions about this product by Z ZANMAX, contact us by completing and submitting the form below. If you are looking for a specif part number, please include it with your message.